All gemstones used are only premium cut, fairly traded, and/or conflict-free! Our accent diamonds are always natural NEVER treated or enhanced for better color or clarity. For peace of mind, everything within our Rosados Box® line is NEVER simulated or imitation. We only offer stones that are lab grown or natural. Our products are only created with the finest of recycled metals. As part of our sustainability commitment, all our gemstones and alloys can be re-purposed for future redesign projects! All products come with our "Basics Lifetime Guarantee" which includes lifetime of free check-ups, tightenings, and basic cleanings; you are responsible for shipping. If you would like additional coverage beyond our "Basics Lifetime Guarantee," we can include a complimentary appraisal certificate for your insurance company upon request. 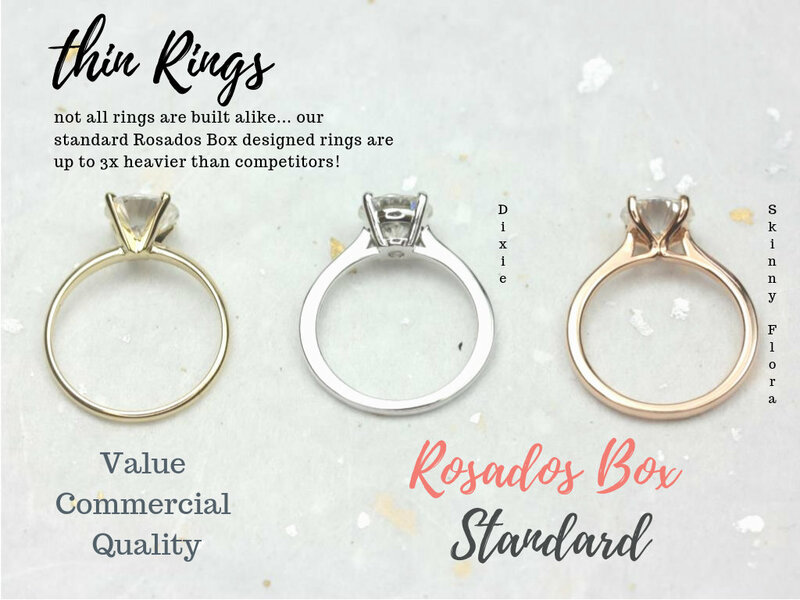 Our appraisal authenticates the quality of your purchased Rosados Box® product. DISCLAIMER: Due to the lower body and open gallery design, we highly recommend having your wedding ring soldered to this engagement ring or have the engagement ring worn alone (without other rings next to it). 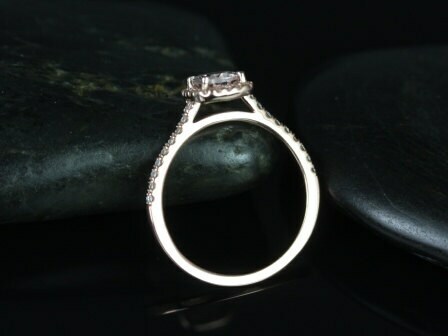 We have found that sometimes, when bands are worn together, the wedding bands can slide up and hit the center stone causing the center stone to possibly chip; having the rings soldered will greatly reduce that likelihood. We recommend that all jewelry be worn mindfully in order to preserve each item's original integrity. Sizes available: 3.5-8 (Larger and smaller sizes are available. Priced upon request) Please note needed size when checking out. 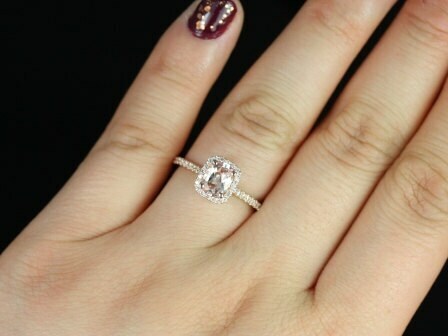 Metal Available: 14kt rose gold (as shown), 14kt/18kt yellow gold, 14kt/18kt white gold, 14kt rose gold, platinum. Please allow 2-3 weeks for item to be hand crafted from scratch. Jewelry comes with a box and tote! We accept payments via PayPal and direct checkout through Etsy. Sorry we don't accept checks/ e-checks or money orders. Once payment received, please allow 1-2 days to process and 2-3 weeks for us to create your ring from scratch (we make all our items to order to preserve energy and reduce waste for a greener earth); unless otherwise stated. Tax will be added to shipments within Illinois (10.25%) as of January 1, 2016. For all international packages, you are responsible for your country's duties, taxes, and/or other importing fees. Each country has different procedures and fees for importing so please do proper research prior to your purchase. Thank you! Shipping International (Outside of USA): $60.00 and up. Price varies depending on the amount insured. It is shipped as FedEx international priority. It typically arrives 1-5 business days from date shipped. You are responsible for all duties/taxes received from your country. Prices are subject to change as we follow the current shipping prices provided by the shipping companies. All DISCOUNTED, RUSHED, LAYAWAY/FINANCED and/or CUSTOM ORDERS are non-refundable; this includes partial payments. We reserve the right to refuse returned items we deem as not in sellable condition, damaged, altered, or used. New standard orders, excluding custom, that are completed and to be shipped ,but are postponed or if shipments are withheld, will have a 2 month window from day of completion to confirm the cancelled order for either an exchange or refund, whichever the item(s) is eligible; anything outside of this time frame is not eligible for an exchange or refund . All store credits must be used within 1 year of credit note date. Refunds are returned in the manner in which it was received as long as the provided guidelines above are followed. The cost incurred by us for original shipping will be deducted from all refunds (even on items with “free shipping”), unless the return is due to an out-of-the-box defect or a packaging error on our part. If we re-sized your ring, there will be a $25 charge. If the item was damaged in anyway, you will be charged for the damages. If the item is returned without its original box, tote, and/or all original documents that were shipped with package, there will be a $25-50 charge (depending on what was not returned). PLEASE FIRST CONTACT return [!at] loveandpromisejewelers.com PRIOR TO SHIPPING ITEMS TO OUR SHOP. She will provide the Return Authorization number and instructions on how to ship the item the package back safely for the return. PLEASE FIRST CONTACT Return [!at] loveandpromisejewelers.com PRIOR TO SHIPPING ITEMS TO OUR SHOP. She will provide the Return Authorization number and instructions on how to ship the item the package back safely for the exchange. When the package is created, please send us the tracking number and make sure the item is insured when shipping back as we are not responsible for lost or stolen packages. Please also include within the package 1) a copy of your original receipt WITH you RA#, 2) Provide a copy of your COMPLETED DocuSign. Please allow 2-3 weeks crafting period prior to shipping. PLEASE FIRST CONTACT Repairs@loveandpromisejewelers.com PRIOR TO SHIPPING ITEMS TO OUR SHOP. She will provide the Return Authorization number and instructions on how to ship the item the package back safely for the repair. Note: Warranty is voided IF item has been sized, altered, or worked on by another jeweler other than Love & Promise Jewelers. You will be charged for repairs needed if the item falls into any of the above categories. We offer 1 free resizing within 3 months of purchase (excluding our "Chic Classics Collection") If the size adjustment is within 3.5-8, there no charge for your resizing but you are responsible for shipping to and from our studio. Should the size be larger or smaller than our standard ring size 3.5-8, we will charge market price for the size adjustment. For our Chic Classics Collection, you have 30 days to exchange the ring size for ONLY the price difference between the listed sizes. After the 30 days, there will be labor fee plus the additional materials needed for the size adjustment. For all repair shipments, please make sure to send photos to Repair@loveandpromisejewelers.com of the item shipped in multiple angles. For repairs specifically, take photos of the area that needs to be repaired. When the package is created, please send Repairs@loveandpromisejewelers.com the tracking number and make sure the item is insured when shipping back as we are not responsible for lost or stolen packages. Please also include within the package 1) a copy of your original receipt, 2) a copy of the signed DocuSign. Please allow about 2 weeks for the repair/adjustment, unless otherwise specified. This process is only available for redesigning for different center stone size/shape or new complete custom designs. 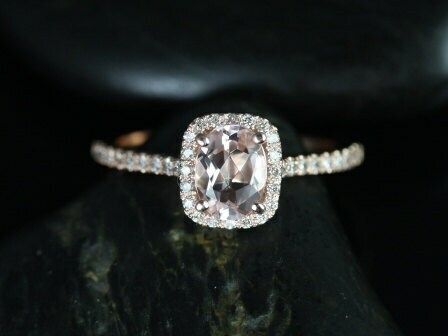 We will not do the 3D Custom Experience for a different stone color, ring size, or metal color. Thank you for understanding! Within approx 1.5 weeks of your purchase/deposit (we need the project to be paid at least at 50% of total amount to launch project from start to finish), you will receive a 3D rendering of your designed piece of jewelry! We will wait for approval or the needed changes. If changes are needed, please allow 1-3 business days for the changes to be made. We will again email you the new CAD; you are allowed up to 5 sessions of changes. To be honest, we have never had to do more than 3 times because usually get it right 75% percent of the time on the first try, 20% on the second, and the remaining 5% is for the slight adjustments! 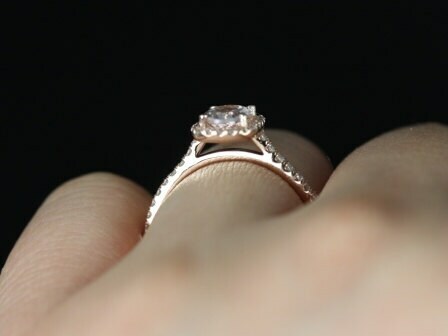 Upon approval of the 3D CAD, we will shoot straight to finishing the ring which will take roughly 3 weeks for growing the wax, molding, casting, setting the stones, additional engravings, and quality control. IF you are adding milgrain detail to the ring, please allow an extra 1-3 business days on top of that. We will email you a photograph of the item when finished and wait for the approval prior to shipping out the item. When we receive the approval, we will ship out promptly if the item is paid in full. If the item has a remaining balance, we ask for the remaining balance to be paid in full prior to shipping out. 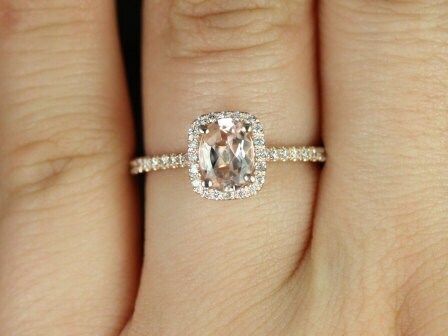 Please note, once we decide on a design for the 3D experience we cannot make extreme changes in the design such as having a ring start as a simple solitaire and change it into a halo ring with accent flowers and pave diamonds; this is because it requires the 3D CAD to be completely redesigned. If the changes were adding to the height, bringing the split on the shank further down, or having the stones go further down the ring, etc… these changes are not a problem at all. You will be charged for new CAD fees if you change you mind on the overall design, shape of stone, size of the stone, or anything that requires complete rebuilding of the ring from ground up. For further information on the custom design process, please do not hesitate to contact me. We are pretty flexible on the manner of which you'd like to pay. We only ask that the item be paid in full WITHIN 3 months. For items over $1,500, we can offer 6 months for layaway payment plan; please inquire for additional info. So by the time you make the final payment, your ring will be ready to ship out. We use a program that sends an email that attaches an invoice that details your project. To pay each time, just reference the same invoice link we had sent you to make your payments. Every time you place a payment, you will receive a follow up email that details your deposited amount for your record; the amount deposited will automatically deducted from the remaining total. Yup!!! It's that easy! Please note, we will NOT start the project until the item is at least 50% paid off. Thank you in advance for understanding. Layaway option is not available for certified diamond engagement rings that are 1ct and over (center stone). All layaway projects are non refundable; this includes partial payments. 1) First & Last Name? 6) Style of ring? Metal? Ring size? This info will better assist us with detailing and launching the correct project. Thank you! For all of those who are concerned with the security of your credit card info, we do NOT store any of your credit card info. It is all encrypted and processed through the merchant companies used. 1) Remember this rule: First to take off and Last to put on! Always put your jewelry on last after all your make up, hair styling, and putting on all your clothing. Always take off your jewelry for anything strenuous such as working out or lifting heavy objects. This includes ANY type of workout, including yoga, weights, dancing etc....Every time pressure is put on a ring (even thick rings) it will shift the original shape, after about 100 times of shifting the ring, and the original foundation will change. That's why all rings' stone will eventually loosen with continuous impact. 3) ALWAYS take off all jewelry prior to going to bed. Your blankets can catch onto the prongs and break them off or you can damage the ring by hitting your hands against the headboard. 4) NEVER put your jewelry into any harsh chemicals such as chlorine, bleach, hairspray, etc... These chemicals break down and wear away the original chemical composition of the metals or damage the stones. 5) NEVER wear the rings with rubber/latex gloves; the tension/pressure from the tightness will loosen prongs and then cause the stone(s) to eventually loosen and/or fallout; in addition, the prongs can potentially puncture the gloves causing cross contamination. Wearing loose winter gloves, pulling gently on and off is ok.
6) ALWAYS Store all jewelry in room/cool temperature and AWAY from sunlight. The sunlight can damage certain gemstones like how it can damage your skin. Yikes! 7) Make sure to have your jewelry checked by a local jeweler or you can have the item sent back to us for inspection and tightening anywhere from every 3-6 months, if worn daily, in general for all jewelry. For full eternity rings and micropave rings, stones would need to be inspected/tightened at least every 3 months as these ring are require more care due to design. This is a like a regular check up for a car, since the ring is made with teeny tiny prongs, readjustments are necessary when the item has been banged around and endured everyday terrain! This will keep your ring in great condition and prevent stones from coming out! 9) Finally, always wear your jewelry with responsibility. Please note, all jewelry that is designed with delicacy needs tender loving care! Jewelry is not resistant to normal wear, activities or trauma; this is especially true for rings since hands are regularly subjected to extensive abuse. General rule of thumb, the more delicate and detailed the piece the more you should be gentle and wear with care. When worn with care, the item's quality will last longer. Hopefully this information will help you maintain and keep all your jewelry beautiful! Yay! If you may need any additional detail on care for certain stones, please do not hesitate to contact us. We, at Rosados Box™, are confident in our work! That is why all of our products sold come with a 1 year limited warranty against any manufacturing defect. If you believe your item has a manufacturer defect, please contact us immediately. If we deem your merchandise is damaged due to a manufacturing defect, we will repair the merchandise at no charge. If we deem your item is not a manufacturer defect, we will reach out to you regarding the possible options for repair and the charges for the service. The warranty does not cover jewelry that is purposely damaged or not worn responsibly. Any alternations not made by our company will void the warranty. Our shop warranty does not cover damages occurred under normal wear and tear, trauma, or activities. * If the product does not undergo the tightening/check up every 6 months, we reserve the right to cease the limited manufacturer warranty. You are responsible for the shipping and handling charges to and from our shop for all services. Rosados Box™ offers lifetime free tightening and check ups. We suggest all jewelry worn regularly to be checked and tightened at least once every 6 months; ideally every 3 months. This is because the stones are all held by prongs and they can easily snag on things or get knocked around quite a bit from wearing; this can loosen the stones with time. You are responsible for the shipping and handling charges to and from our shop for this service. For coverage beyond the 1 year limited manufacturer warranty, please ask for an appraisal at no charge when checking out so that you can get the ring insured from your own private insurance company in the event of an unlikely occurrence. We highly recommend www.jewelersmutual.com for a good reliable jewelry insurance company. Please bear in mind, jewelry is not resistant to normal wear, activities or trauma. This is especially true for rings since hands are regularly subjected to extensive abuse. We do not provide warranties for damage due to normal wear, product loss, loss of stones or theft. We do not cover damage or loss resulted from failure to receive to obtain necessary repairs in order to maintain the integrity of the product. -Prongs and precious metals, in general, wear down and may require rebuilding over time. -Bent, caught, broken, or worn down prongs(s) allowing a stone to fall out or be lost due to normal wear or activities. -Loss of stone or a stone has fallen out due to chipping or breaking caused by normal wear or trauma. Do you offer a warranty on your products? Do you offer custom design as an option? Do you offer financing? Or Layaway? Yes & yes! We offer special financing options every month through Wells Fargo Financing. And we offer layaway payment plan through out shop for up to 6 months. *Some restrictions may apply. Please feel free to message us to learn more! 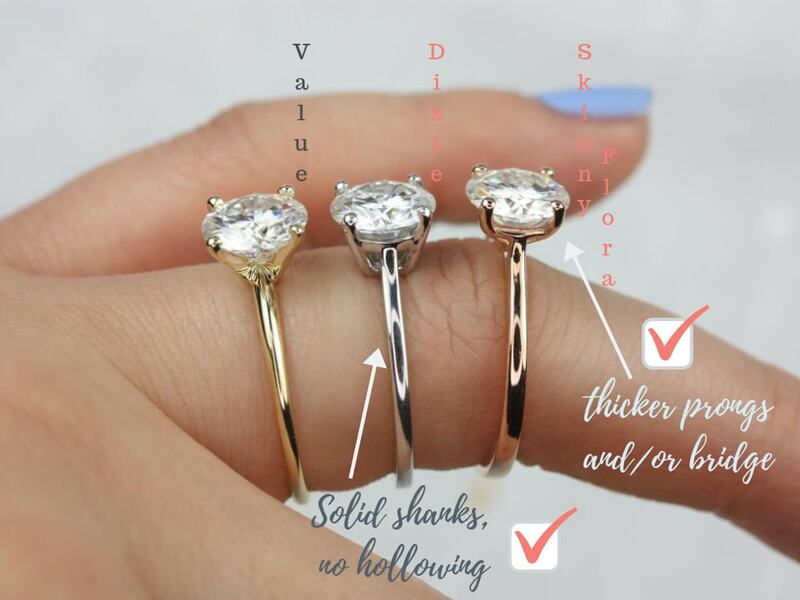 How to know your ring size? Feel free to purchase our reusable ring sizer here: https://www.etsy.com/listing/126106931/travel-size-adjustable-ring-sizer?ref=shop_home_active_2&frs=1 . We highly suggest following the instructions provided in listing to the best fit! What is difference between Moissanite and Forever One? Both options come with a lifetime warranty through C&C. The primary difference between the two is the Forever One option is the industry's top standard for moissanites. The Moissanite line by C&C, also known as MOI, are all the moissanites that don't make the Forever One grade but are still better than the market's generic brands. The Forever One moissanites are all a minimal VVS clarity and Excellent in polish, symmetry, and cut grade compared to the MOI line being VS-SI in clarity and Very Good in polish, symmetry, and cut grade. My fiance loves this ring, and it arrived very quickly. Thanks so much! I'll be buying the matching wedding band soon.